As dawn broke on this beautiful Saturday, Phil and myself made our way to Fernald Preserve for the 3rd installment of Bird Study Merit Badge Workshop. We purposely arrived early to see if the Garganey was still in Lodge Pond. This would be a life bird for Phil, ( probably for 99% of everyone else there) so we were anxious to spot it before we went to the Visitors Center to set up. We weren’t dissapointed. We were able to see the Drake feeding on the opposite bank among the tall grass that was growing on the edge of the pond. With it getting close to the 9:00 am start time for the workshop, we made our way to the Visitors Center. The meeting room was incredible, and they went out of their way to accommodate us. We had full access to all the video and computer equipment they had. They were the perfect host and look forward to going back next year. However the real treat was having a rare bird present while this was going on. If any of the scouts become bird watchers they will remember the Garganey at Fernald Preserve. John Marvin showed up right as the bulk of the scouts were showing up. He had volunteered to help, and being a great birder it is an asset to have his eyes and knowledge available. We started the workshop with introductions and showing them where the restrooms were. I asked John to stay out front because a birder I know saw a Sora right in front of the visitor center in this small marshy area. I don’t think we were in the classroom more than 10 minutes when John called and told us a Virginia Rail was just seen. Being a difficult bird to spot, no better time than now to get the scouts outside a see a really good bird. We had some great views of the rail and had the Sora calling while we were there. We divided the time into classroom stuff that is required for the Merit Badge, and going into the field and identifying birds. Last year we were a little nervous that we wouldn’t see the required 20 bird species. However today we didn’t have to worry about that little technicality. For the short amount of time we spent outside we had a decent number of birds. After spotting the Garganey, the group walked the trail from the observation deck at Lodge Pond. The trail runs parallel to the entrance road to the right and Lodge Pond on the left. We left the trail and walked the road back towards the cars. The row of evergreens that line both sides of the road supplied us with some good looks of several warblers. We made our way back to the Visitors Center for lunch and to finish up whatever was necessary for the Merit Badge. Mainly make the bird feeders, and discuss how range maps work in a field guide. So as the scouts were eating one would go back and work on his feeder while the others ate. And during this time they were identifying bird calls from some of the birds they saw. After everyone was finished it was out into the field for more birding. This time we went out back from the Visitors Center onto the open grassy section that heads back into the woods. This being the afternoon there wasn’t much going on bird wise. As we got closer to the woods things started to pick up and we were able to add to our day list. Before we headed back the scouts checked out this large stand of pine trees. Besides birds in the tops of the trees, there were plenty of butterflies. We slowly made our way back to the Visitors Center where blue cards were filled out and the scouts were allowed to leave if a parent was there. It just so happens that this is the photograph that I e-mailed to my friend Ann Oliver. Ann is a officer for The Ohio Ornithological Society. After telling her why we were here today, she thought that it would make a great story for the society newsletter. She asked me for a picture of the scouts, so this is the one I sent. Received an E-Mail from John Marvin today, where he asked if I wanted to go birding with him today after work since he just got back into town. Sure I told him. I had wanted to head over to Ellis Lake/ West Chester Wetlands, so I asked him to join me. A couple of E-Mails later he told me of someone posting on Cincinnatibirds that a Garganey was seen at Fernald Preserve at 3:30 this very afternoon. 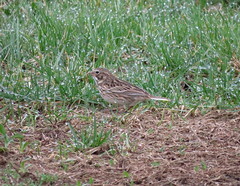 From what I’ve heard this might be the 2nd time this bird has made an appearance in Ohio. We’re talking very rare bird here. So you probably know what I did. Scratch the Ellis Lake trip, we’re off to Fernald. I was probably no more than 5 minutes behind John as I noticed all the birders lined up besides the front pond at Fernald as I pulled in. That’s always a good sign. And sure enough, there it was. A beautiful Drake Garganey. That’s the Garganey at the waters edge, in front of the Blue-winged Teal. With this picture you can really see the white scapular mark above the eye. Another view that’s not very clear. After a round of high fives for a new life bird, we thought well why not go over the Ellis Lake after all. John feed the info into his Garman, and off we went through the back roads of Butler County. We arrived at about 6:30 and started towards the flooded corn field to the left of the causeway. We noticed a lot of wading birds and needed to get closer. This picture shows just a few of the Lesser Yellowlegs in this field. A wider view of the flooded field. The causeway is the grassy strip of land on the other side of the water. So John and myself walked around in this field for several minutes spotting only some Least Sandpipers, Spotted Sandpipers, and the large group of Lesser Yellowlegs. So as I was setting up a shot with my spotting scope and digital camera, John shouted “Phalarope”. Well I just about wet my pants. So I spun around and trained my scope on where he was looking and sure enough, a Wilson’s Phalarope. I had a real difficult time keeping the bird in focus and centered. So the vignetting will be apparent in the following pictures. Focusing was difficult because he was constantly moving. There he is, smaller of these 2 birds. I left there feeling such a rush, I couldn’t stand myself. Starting off the day with the Royal Wedding, and ending with 2 new life birds numbers 275 & 276. What a way to end the day. It certainly feels like I’m wearing a path between my driveway and Caesar Creek State Park lately. 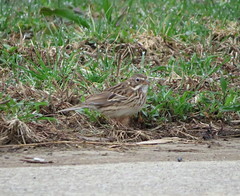 A sighting by Larry Gara earlier today yielded another life bird for yours truly. They reported seeing a Willet and a Cattle Egret at the beach. I also received a call from Allan Claybon informing me of the same sighting. Well you don’t have to tell me twice. Home I went to gather the necessary optical paraphernalia, then I-71 North. When I talked to Allan while driving to see if he was still there, he told me the Willet was perched on the top of what Allan thought was a roof of some kind. He didn’t remember any structure like that prior to the rising water. Remember the beach is still under water. I arrived in a moderate rain, which quickly stopped several minutes later. I spotted the Willet just like Allan described, perched on top of a roof. As you can see the Willet is standing on top of a roof. The roof however is the roof to a bulletin board that is used to post beach regulations and other important information. As you can see the water is a bit high. This next picture is my first attempt to digiscope with my new camera and spotting scope. Without the proper attachment yet it was difficult to center and get a full screen picture. This will be remedied as soon as my camera adapter comes in the mail. As I was standing watching the Willet, I noticed the Cattle Egret fly past and settle down further down the beach. Maybe I shouldn’t say beach, since there isn’t any. How about where the grass meets the lake. Anyway I took this picture from where I was watching the Willet. For me that’s too far away, so I packed it up and walked closer. A better close-up of the Cattle Egret using my spotting scope and digital camera. 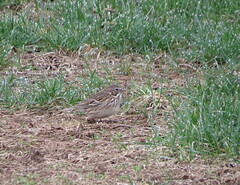 Remember my digiscoping skills is in it’s infancy, so they may not be the best pictures, but I’m real happy. Now I can share what I’ve seen with you, my readers. WOW! That’s the only way to describe the morning spent with the Cincinnati Bird Club as we visited Shawnee Lookout Park. Leaving home at 6:45 for the drive over there, knowing ahead of time that Lawrenceburg Road was going to be closed, I detoured through Cleves to reach my destination 15 minutes before the start of the field trip. With about 9 other bird club members we started out at the still flooded boat ramp. The sign in the middle of the water says “Caution”. We drove and then would park at various locations throughout the park. After we would park the group would bird in the area to see what we could find. With Spring well under way, the hot bird for the day was any or all warblers. However we racked up some pretty good numbers after the day was over. One of the areas we parked there was a clearing where we could see the smoke stacks of the power plant over near Lawrenceburg. We were concentrating on the shorter of the smokes stacks. We had a spotting scope set on that particular smoke stack because of the Peregrine Falcon that resides there. And sure enough it was there. Group members checking out the Peregrine Falcon. We had good luck calling in warblers today. a couple of group members had with them I-Pod’s that had warbler calls pre-loaded on them. We were able to bring some warblers in real close, like this Prothonotary Warbler. I was with John Habib as he called in this Prothonotary Warbler sitting on the cable to the left of the post. This is the same Prothonotary Warbler, but overhead as we walked the boat ramp area. The only Easter Bluebird we saw today. You see how it turned it’s head at the last minute to avoid getting it’s picture taken. Spring flowers in bloom along the road. As the morning wore on, a couple of us parked our cars at the end of the park road, so when the group ended the hike, we would have transportation back to the rest of the cars. One of the older group members who didn’t want to walk that far drove slowly down the road. She would park and do a little birding from her car window. As we got closer to her, we noticed a Red-tailed Hawk fly down onto the ground right in front of her car. We naturally thought that it had caught it’s lunch. However as we got closer, we noticed that the hawk wasn’t flying away. We couldn’t tell for sure, but we knew that something was wrong and the bird was injured. It just sat there by the side of the road as we kept our distance. The group leader, Mark Gilsdorf phoned a friend who is a volunteer for a Raptor Rehab facility. So someone went and got a cardboard box to put over the hawk till the volunteer arrived. We had a group member stay there with the hawk so no one would bother it. A picture of the injured Red-tailed Hawk. We had more success as we neared the end of our hike. Cerulean Warblers are very common in this section of the park, and today was no exception. I think we counted 4 different Cerulean Warblers, which is pretty good. A sad picture of a Summer Tanager. After I had left the park I stopped at Lost Bridge to take a couple of picture to show how high the water has become. And to think with more rain on the way, the river is only going to get higher. After everything was said and done, it was a very successful day with one new life bird. A Yellow-throated Vireo, my target bird for the day. With my two eldest children coming home this weekend, and with quite an extensive honey-do list, birding wasn’t on my mind when I checked my E-mail this afternoon at about 3:45. One of our local birders Jay Lehman spotted a Lesser Black-backed Gull at the beach at Caesar Creek State Park. My mind was made up to head up to see if it was there, however I wanted to convince David to join me since neither one of us have this bird on our life list. He declined, due to having just driven down from Bowling Green. So I hit the road a little after 4:00 pm and made pretty good time getting up there. After pulling off the highway I gave Rick Asamoto a call to see if he’d heard of the sighting. Naturally he had and was on his way there right now. He told me that John Habib was on his way as well. As I pulled in the beach area I saw John standing by his spotting scope. The gull was still there, and I got some real good views of another new life bird. The Lesser Black-backed Gull is in the center of the picture with the darker wings. So after visiting with Rick and John for a few minutes it started to rain so we decided to pack it in. Back home again in a little more than an hour.